I'm totally beat today!! 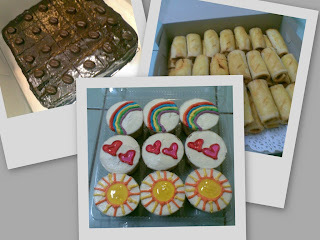 hehehehe...Just got back from Mount Kiara...delivered cuppies to Security Comm..then off to Jln Pinang...delivered cakes and Sardine Rolls to KFH - Etiqa building. 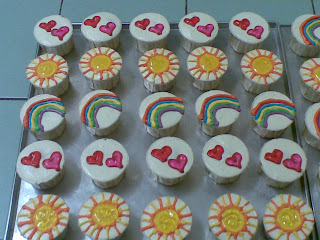 This was ordered by Ms. Fatin from Security Comm in Mount Kiara....64 pieces of Pure Vanilla cuppies for kids. Even though the order period for the office mix is supposed to be till the end of this week, we have to officially close all orders today(22/07/08). After officially accepting orders yesterday, we have quite a hefty number of orders. The last order we accpeted was at 12 noon. Thank you for all your support. For those who missed the opportunity to order during this promotional period...do keep yourself posted for our coming promotions! How was the weekend? Mine was extremely hectic!! I had loads to do! 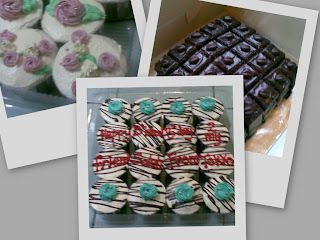 I was running up and down town... delivering cakes...meetings...appointments...huhuhuhu...well..that's life huh? HAPPY BIRTHDAY TO A DEAR FRIEND. May God bless you. This is his FIFTH TIME ordering!! Thanks so much! 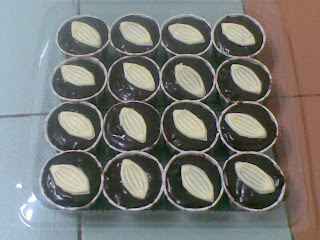 This Moist Choc was made for his loved one in PWTC..
Another corporate order from KFH. 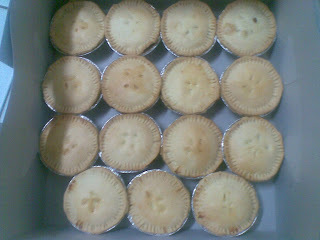 They ordered 25 pieces of Chicken Pie, 1.5kg of Vanilla Butter cake and Moist Choc cuppies. This was a FAST SALE. 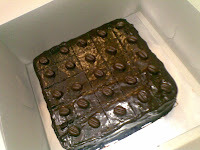 1kg if Moist Choc. What will we be offering? 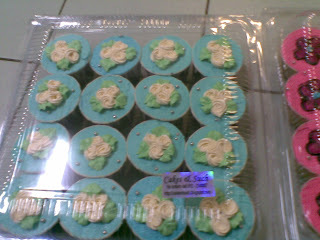 For a limited period...you can buy a set of 9 M-Size cuppies for a special price!! Wait! 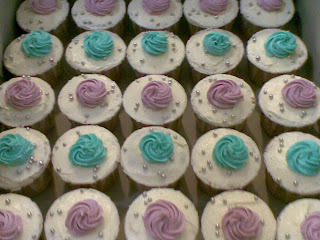 There's more...the set of 9 will consist of three flavours. Buy a set and you will get 3 pieces of Vannila cuppies with Strawberry filling, 3 pieces of Tangy Orange and 3 pieces of Oreo Surprise! For orders outside Cyberjaya and Putrajaya...there's more news for you...if there is a minimum of 5 orders from the same office...a minimal delivery charge of RM3 will be charged for each order!! Now that's a good deal!! 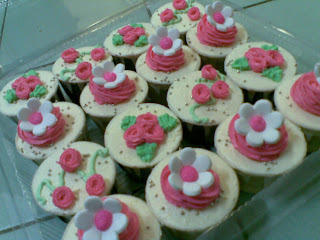 Usually you would have to pay RM15-RM25 for delivery charges. Please note that since this is a promo...there will be no customization. **Note: Design and colours may vary. I finally managed to transfer some of the pics to the PC. Yea!! 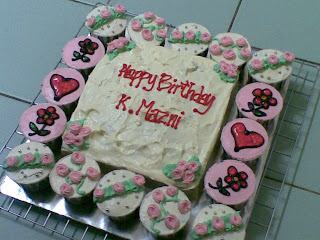 This is especially made for K.Mazni...HAPPY BIRTHDAY DEAR!!! 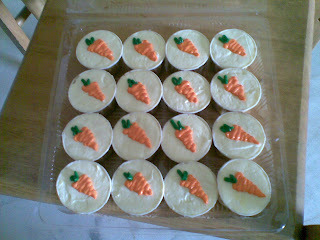 The center is Carrot cake topped with cream cheese. 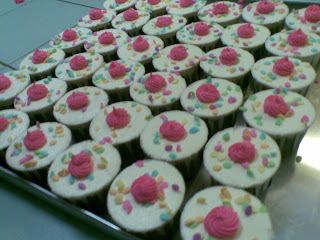 It;s surrounded by Moist Choc Cuppies! 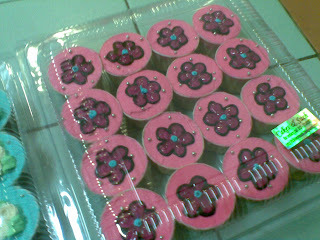 This one is Catt from Bukit Jalil...her second order. 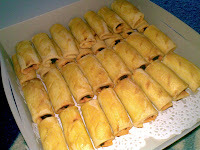 An order from a regular customer...K.Azlina from KFH...thanks!! 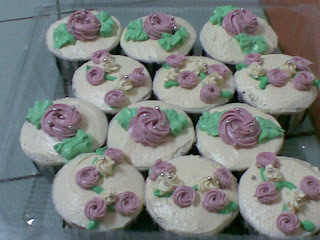 - Vanilla Choc Chip with Chocolate Ganache. 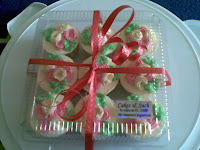 These two sets were ordered by Sabrina from Australia for the cousin and a friend in Petronas Twin Towers. It's her third time ordering. 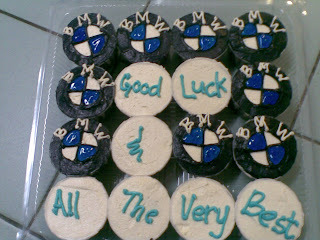 These are for KFH's Corporate Training. Ordered by their Training and Development Unit. The top pic is Chocolate Banana cuppies..followed by Vanilla Choc Chip...and a last one...a repeat order for Chocolate Banana. 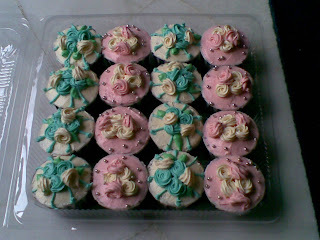 This order was made for Siti Zubaidah..from MMU...thanks for ordering! 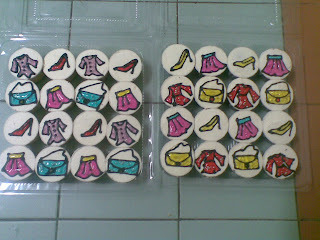 Shopaholic Theme!!! Ordered by Hayza! I must say...this is the toughest order!! Hmmm...I think I may have missed some orders...but hope you guys enjoyed some of the pics! 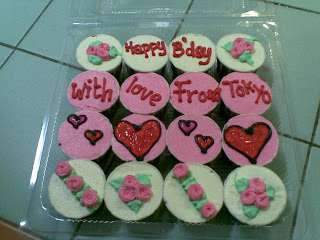 The Cuppies drizzled with chocolate there was ordered by Helmi from Japan for his friend's birthday. 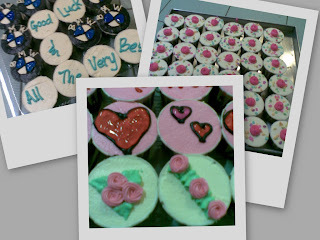 Delivered them to PWTC. 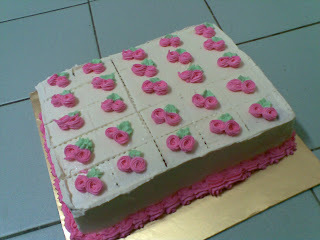 The 1kg Moist Choc had to be cut into 'lil squares for a Corporate training at KFH. ** Note: Price quoted is based on simple designs. For elaborate designs such as logos, cartoon characters, sugar flowers and fondants, please call 012-2140087 for further advice. This Strawberry flavoured cupcake is oozing with strawberry filling. It’s frosted with French buttercream and topped with a strawberry fondue. – A perfect indulgence! Sink your teeth into this cuppie loaded with carrots, chopped walnuts and bits of pineapples. It’s topped with the ever creamy cream cheese! – A perfect combination! 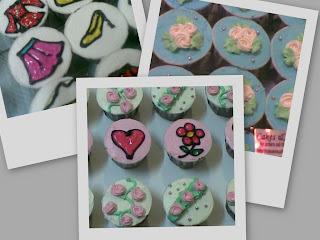 Each Moist Choc Cupcake is filled with slices of fresh bananas. It’s topped with our signature Chocolate Topping. - It’s pure satisfaction! 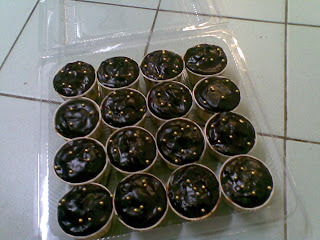 Your mouths will be drenched in this super duper Moist Choc Cuppie that is topped with our signature chocolate topping! –The sinful cake for chocolate lovers! 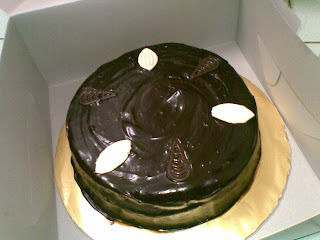 This wicked and sinful chocolate cake is made especially for chocolate lovers! 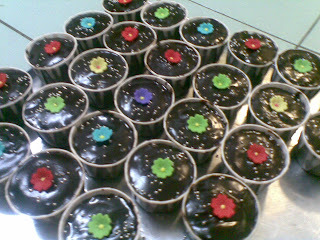 The chocolate filling and chocolate topping makes it irresistible! – You’d be asking for more! 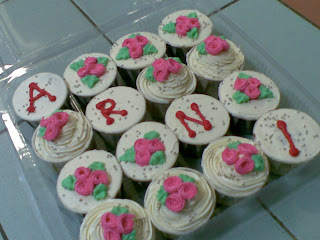 Note: There will be an additional charge for customized cake. This would depend on the design requested and the size of the cake. This healthy selection is filled with different tastes and textures. Savour the taste of carrots, walnuts, pineapples and raisins - all mingled in one secret recipe that will leave you satisfied. This selection is frosted with Cream Cheese. – A unique taste! This old fashioned vanilla butter cake adds simplicity to the array of cakes we have. It has a simple, buttery taste but it’s bursting with vanilla flavour. – An excellent choice for kids’ birthday cakes! 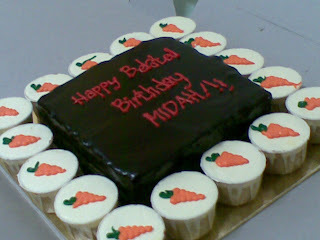 Note: There will be an additional charge for customized cake. This would depend on the design requested, frosting and the size of the cake. This zesty cake has a mild tangy flavour for those who like something simple but different. – A must try! This Moist Choc cake is filled with fresh banana slices and chopped walnuts. It’s generously topped with our signature chocolate topping – It will drive you bananas!